The Jeep Cherokee nameplate may be closely associated with the Jeep XJ-chassis offered from 1984-2001, but the name itself was first used on this, a version of the SJ Wagoneer. This is Majorette 263, the Jeep Cherokee SJ. The Wagoneer bodystyle and platform were originally introduced in 1963, alongside the related Gladiator pickup, and featured the Jeep Tornado overhead-cam I6, which was later dropped for various AMC straight-sixes. AMC V8s were made available, and the two-door bodystyle (a four-door greenhouse without the rear doors) for the Wagoneer was dropped in 1967. 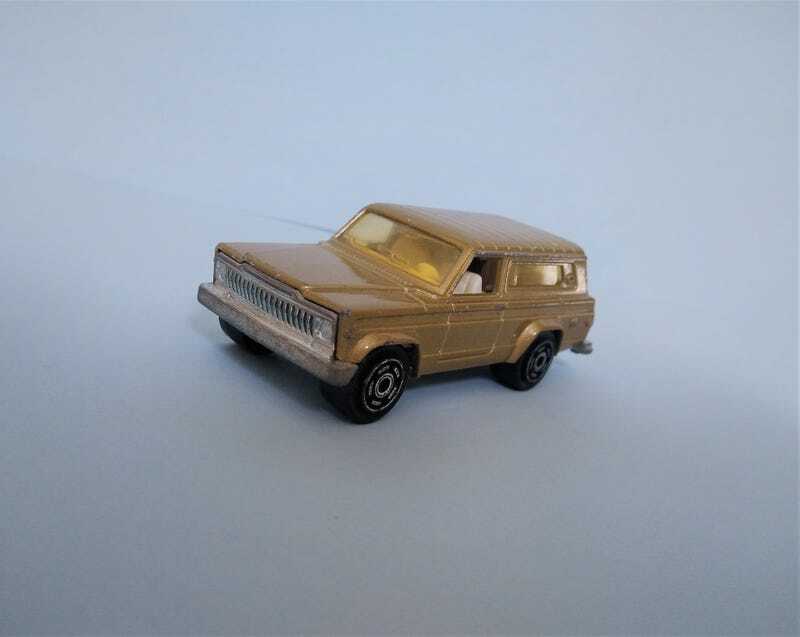 A new two-door bodystyle was made, and the Cherokee was introduced for 1974 as a sportier version of the Wagoneer, which had gone a bit upmarket by then, and provided competition to the Blazer, Bronco, and Ramcharger. All models (Wagoneers and Cherokees) were by now powered only by AMC I6s and V8s, and a four-door Cherokee was introduced in 1977, and all SJ Cherokees were discontinued by 1983, before the introduction of the more well-known XJ Cherokee. Exterior detail is quite good, with rear tailights, fuel filler, side markers, a very fine grille, and the proper body lines all cast. The rear tailgate is a separate piece, with the license plate 267 JE69. Interior detail is nice, with a textured bench across the front. The star of the show is, of course, the dog inside. The tailgate folds down to show the dog on its hind legs, facing the rear, with the dog bed where the rear bench would normally be molded. All of it is in white plastic, making it a lot easier to see than the typical black plastic. As with other period Majorettes, the base merely contains identifying detail, and the scale is listed as 1:64. In addition to this golden brown, this stock SJ Cherokee casting was also available in medium green. Variants with the lifted chassis and wide offroad wheels seem to be more common, and indeed, there are more variants of that. An ambulance variant of this casting was also introduced, with a light bar on the roof, a raised rear section, and rear barn doors. This is a loose piece that came with an eBay lot of cheap Tomica and Majorette casts. There is a fair amount of edge wear, but the charm of the casting shows.